Chile, is known for producing some of the Region’s best wines, such as Malbec. Remember, Red wines require at least 3 months age. Wines should not be stored at room temperature. In order to preserve the integrity of the wine, ideal storage temperature should be 10 C or 50 F.
A full bodied red wine which is dark in colour. The flavor can be enhanced by oak aging and is usually preferred by many when it is aged. In addition, Cabernet Sauvignon is widely known for being a mix between Cabernet Franc and Sauvignon Blanc. Often times blended with Merlot to speed up the aging process. *Oak Aging Recommended. Traditional Food Pairings: Cabernet Sauvignon is known to the majority of winemakers as the ideal food wine. This type of wine pairs excellently with roast turkey, lamb, plain roast or grilled meats. Also, Cabernet Sauvignon pairs perfectly with many meat dishes, like beef and stew. A dry wine that is rich in flavor and ruby red in colour. It is velvety smooth and rich in aroma and is perfectly liked when it is aged. Merlot grapes are often blended with Cabernet to produce a softer wine as well as shortening the Cabernet Sauvignon’s aging requirement. *Oak Aging Recommended. Traditional Food Pairings: Merlot is well known for being enjoyed on its own; however, it can pair itself easily with many foods. Some pâtés, duck, and meat casseroles help to make Merlot complete. Malbec is known for producing wines with deep colour and an abundance of tannin. It is a complex wine with plum-like flavours and aromas. Very popular in Argentina, Malbec produces young, full-bodied wines with fruity, berry-like aromas and flavours. Malbec’s flavour is typically enhanced through oak aging and is often blended with Shiraz. A wine that is a hearty, rich red wine that is smooth in flavour. Pinot Noir has a soft texture and is dark in colour, which makes it an excellent sipping wine! *Oak Aging Recommended. Traditional Food Pairings: Pinot Noir can match easily with some meat and fish dishes. To enjoy Pinot Noir with a good meal, chicken, rabbit, ham, roast beef, salmon and salmon trout would be good to try. Produces a dark, rich, and robust wine that is intense in colour and is balanced in character. Shiraz is rich and fruity and more intense in flavor. In addition, the majority of wine makers enjoy Shiraz when it is young, however, it is mostly enjoyed when it has been aged for a few months. *Oak Aging Recommended. Traditional Food Pairings: Shiraz is usually complemented with food that has plenty of flavour. 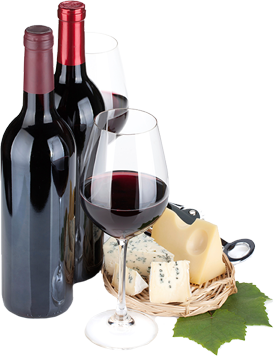 Barbecued foods, turkey, lamb, casseroles, chicken and cheddar cheese are foods that are usually enjoyed with Shiraz.